Deadpool and Captain America became partners in crime this week when in the new issue of Deadpool #27, Captain America recruits Deadpool into helping him commit murder on the steps of the Lincoln Memorial. While Deadpool’s role in the crime is that of an unknowing accomplice, the murders further demonstrate Captain America’s turn as Marvel’s biggest villain in the lead-up to Marvel’s Secret Empire event series. This week’s issue of Deadpool sees three superpowered individuals from the future — all dressed as Captain America — call out Steve Rogers to fight them on the steps of Washington D.C. 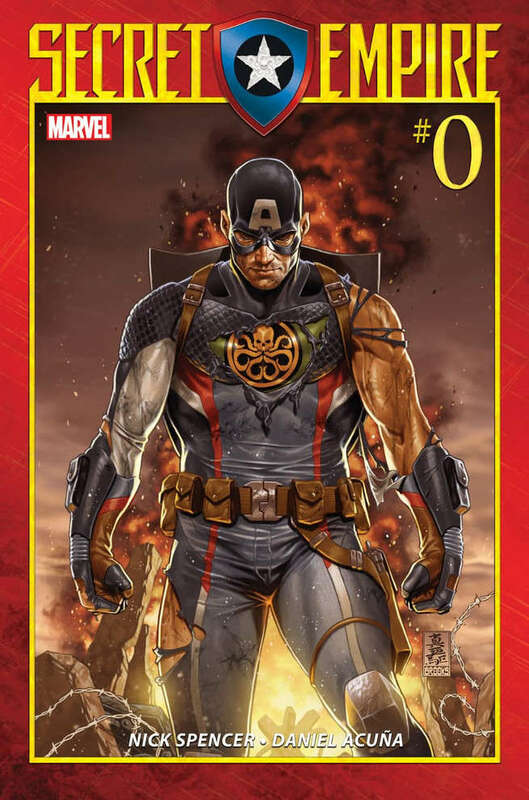 The three strangers have returned from a future where the original Captain America, who is secretly a HYDRA agent, takes over the United States and imposes his tyrannical Secret Empire. In a sense, these three time travelers are actually the heroes of the story going back in time to kill a villainous Captain America and an unlucky Deadpool. Unfortunately for them, Captain America recruits an oblivious Deadpool who truly believes that these three are supervillains. Teaming up with the Merc with a Mouth, Steve Rogers goes on to kill the three “villains” who threaten to reveal Steve Rogers’s true HYDRA affiliation and Secret Empire plans to the world. The issue is an interesting one because it ends with Captain America ordering Deadpool to gun down the final time traveler after murdering the other two. Although SHIELD Agent Phil Coulson arrives on the scene to protest the unlawful killing, Captain America is shown as having planted a gun on the victim’s body, further leaning into the fact that evil Captain America is a metaphor for corrupt government tyranny. It’s also interesting to note that this issue practically confirms the Captain America and Nazi connection. First, because of the way Captain America murders the three using Deadpool as his personal, one-man death squad. Secondly, because the plot of this issue is actually just a play on the classic “If you could travel back in time to kill Hitler, would you?” thought exercise. Captain America’s “Secret Empire” will play an even bigger role in Marvel comics in the coming months as the self-titled event series will see the whole Marvel universe unite against the evil Captain America and the U.S. government, which he takes over. The series is a reference to a classic Marvel storyline where it was revealed that the U.S. President and his government was actually a villainous cabal. The term, however, is also associated with the phrase “Invisible Empire,” which is another reference to the Ku Klux Klan. A particularly chilling association considering the state of current affairs within the actual United States. Deadpool #27 by Gerry Duggan and Sean Izaakse is available in comic book stores and digital retailers right now.